Before starting any real estate transaction, either as a buyer (grantee) or seller (grantor), review the state's laws governing deeds and real property. In Colorado, find this information in http://www.lexisnexis.com/hottopics/colorado/) C.R.S. 38 (2012). Colorado explains that its goal with the real property code is to "render titles to real property and every interest therein more secure and marketable, and it is declared to be the policy in this state that this article and all other laws concerning or affecting title to real property and every interest therein and all recorded instruments, decrees, and orders of courts of record, including all proceedings in the suits or causes wherein such orders or decrees have been entered or rendered, shall be liberally construed with the end in view of rendering such titles absolute and free from technical defects so that subsequent purchasers and encumbrancers by way of mortgage, judgment, or otherwise may rely on the record title and so that the record title of the party in possession is sustained and not defeated by technical or strict constructions" (C.R.S. 38-34-101). To boil this down to its basic message, Colorado requires specific information and procedures to ensure that real estate deeds and other documents related to real property function efficiently, and according to the intent of the named parties. A real estate deed is a legal instrument used to convey ownership in land from one person to another. In most cases, the transfer is considered a fee simple estate, which means the new owner gains absolute ownership and control of the property. Colorado law assumes fee simple estates unless something less is specified in the deed (C.R.S. 38-30-107). - The grantor "warrants to the grantee and his heirs and assigns the quiet and peaceable possession of such property and will defend the title thereto against all persons who may lawfully claim the same." To change the deed into an instrument without warranty covenants, omit the words "and warrant the title to the same" (C.R.S. 38-30-115). A special warranty deed also carries specific language: "and warrant the title against all persons claiming under me." This guarantees that the grantor has no knowledge of any claims on the title, and will "warrant and defend the title to the grantee and his heirs and assigns against all persons claiming to hold title by, through, or under the grantor" (C.R.S. 38-30-115). A quitclaim deed conveys only the grantor's rights, if any, in the real estate. It contains no terms implying covenants of warranty and says "sell and quitclaim" in the granting clause instead of "sell and convey" (C.R.S. 38-30-116). - Grantor's name, marital status, and address, including the city, county, and state of permanent residency. Also note that if the real property bears a homestead designation under C.R.S. 38-41-201, both spouses must sign the deed (C.R.S. 38-35-118). - The complete legal description of the property -- if it is new or revised from the prior deed, provide the name and address of the individual who prepared it (C.R.S. 38-35-106.5); The description must also contain the street address and assessor's parcel or schedule ID for the property (C.R.S. 38-35-122); If the legal description includes multiple parcels of land that are not listed individually, but presented as "being from one numbered, lettered, or designated parcel to another shall be construed as including the first and last designated parcels and also the intervening parcels unless a contrary intention is expressly and clearly set forth in the instrument" (C.R.S. 38-35-120). - All deeds must be formatted with at least a 1" top margin and " margins on the left, right, and bottom (C.R.S 30-10-406). Another important detail to consider, at least for two or more grantees, is deciding how to hold title (vesting). Colorado allows tenancy in common and joint tenancy with rights of survivorship. Take time to adequately understand the risks and benefits of both vesting choices before deciding which best suits each unique situation. Unless otherwise specified in the deed, conveyances to multiple owners create tenancy in common. Tenants in common basically act like a group of individual owners. Each one may sell his or her portion of the property without regard for the other owners. In addition, because they share separate interests, they are not eligible for the right of survivorship -- if one co-owner dies, that owner's portion of the property rights goes through probate for distribution to his/her heirs. Joint tenancy with right of survivorship is the other option. With this choice, the cotenants share ownership of the entire property. As a result, if one co-owner dies, their shares of ownership increase by dividing the deceased's portion of the real estate. This occurs by operation of law, and without the need for distribution via probate. The decision to become joint tenants must be written into the deed. For example: "AB sells and conveys to CD and EF as joint tenants with rights of survivorship" (C.R.S. 38-31-101). Tenancy by the entirety is not allowed by Colorado law. Any deed purporting to create a tenancy by the entirety will create a joint tenancy instead (C.R.S. 38-31-201). 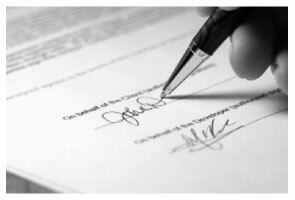 All real estate deeds in Colorado must be written in English or be accompanied by a certified English translation to be eligible for recording (C.R.S. 38-30-140). When the deed is correctly completed and executed, the final step is recording. Recording is the act of entering the real property's change of status into the public record, and an essential step in preserving the chain of title (ownership history). A clear chain of title simplifies future sales of the property and reduces the likelihood of claims against future purchasers. Colorado follows a race-notice recording statute, which means that no "such unrecorded instrument or document shall be valid against any person with any kind of rights in or to such real property who first records and those holding rights under such person, except between the parties thereto and against those having notice thereof prior to acquisition of such rights" (C.R.S. 35-38-109). Put another way, a subsequent bona fide purchaser (buyer for value, usually money) will keep the property if the prior purchaser did not record the deed where they took ownership, and the later purchaser did not know about the earlier purchaser. For example: A conveys to B, who fails to record. A then conveys to C, who performed a title search and saw that A was still the record owner of the real estate. C records the deed from A. B now loses all rights to the property, even if he records the deed from A because C recorded first. In short, record the deed as soon as possible after completing the transaction to protect the grantee's interests against future claims. To provide adequate notice, submit all deeds to the office of the county clerk and recorder of the county where the real property is located. If the parcel is located in multiple counties, record the deed in every county that contains the land to ensure full coverage of notice (C.R.S. 38-35-106, 109), (38-30-160). Upon receiving a deed to record, the recorder will mark the deed with the date and time of submission, as long as it meets or exceeds the standards and requirements listed above (C.R.S. Lawrence W. said: Great so Far! Gregory J. said: Ordered two separate forms for two separate states at two differnt times and couldn't be happier with my purchase. When compared to the cost of having two different attorneys prepare the forms I needed, the value of deeds.com couldn't be beat! Reply from Staff: Thank you Gregory. We appreciate you taking the time to leave your feedback. Have a great day! ROBERT H. said: No review provided.